Things shouldn’t go so smoothly for anyone in the conference semifinals, but the San Antonio Spurs are made from a different mold. There’s been nothing the Portland Trail Blazers have been able to do to slow them down, specifically having problems with Tony Parker who is having an excellent series which might be the result of all that rest he got during the last month of the regular season, leading his team to a 118-103 win and a 3-0 lead in the series. Parker scored 29 points on 12-of-20 from the field with 6 assists. The Spurs once again jumped to a big lead at halftime (20 points at the break) which meant a long period of garbage time and attempts from the Blazers to make the game slightly competitive. Four players in the Blazers’ starting lineup scored over 20 points, but the bench added only six and the combination of LaMarcus Aldridge and Damian Lillard combined to shoot only 16-of-44 from the field. Lillard has especially been struggling on the series. The Spurs have been picking on him defensively, resulting in Lillard playing badly when he’s with the ball as well. Parker is averaging nine points per game while shooting 59% from the field with Lillard being his primary defender, and Wesley Matthews’ attempts at slowing him down haven’t been very successful either. Parker had a different approach in game, taking a lot more shots from deep: 8-of-13 for 18 points on shots from 15 feet or longer. Tiago Splitter with Tim Duncan shadowing him continue to have an excellent series on defense, while their offensive talents make less of an impact, although Duncan did score 19 points. Splitter keeps making life very hard for LaMarcus Aldridge, this time limiting him to 3-of-10 shooting for six points. 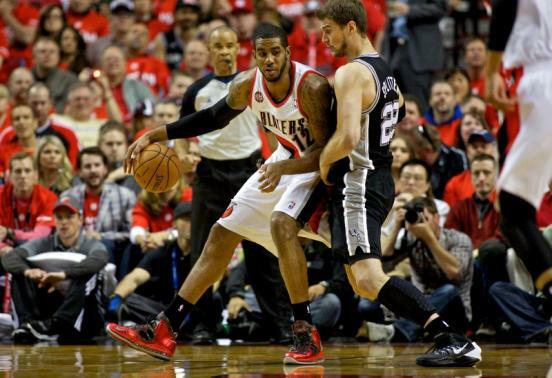 Aldridge is shooting only 32% from the field with Splitter as his primary defender, averaging 0.72 points per play. Dirk Nowitzki had a similar problem in the previous series. Pop, you have to give him credit. He looked at the big picture, and rested me the last month. When we started the playoffs, he told me `Be ready to play 37-38 minutes a game, we’re going to need you to play at your best.’ And so far it’s working. People love to think of the Miami Heat beating the Spurs as simply one lucky possession that went the other way, but it also had something to do with Parker’s fitness problems in the NBA finals. Popovich doesn’t plan on letting that harm his title bid again. The Blazers have no bench, and so far no kind of answer to what just might be once again the best team in the NBA. There’s nothing close about this series with half times that have the Blazers going into the locker room down by an average of more than 20 points. San Antonio follow Parker, and are getting something extra from someone else each night. They’re not getting carried away into making this a shooting contest, but making it about fundamentals, in which they have a huge advantage over the Blazers. Sweep? We’re very close to that. Maybe home court and a sense of pride or fear of elimination might bring back the Blazers into a more respectable mode, but when they’re inferior in almost every position and every aspect of the game, it’s hard to believe that this series is going to draw on much longer, which means the Spurs might get themselves a long rest for players who usually really need one.